Stock photo of the schist rocks on the banks of the river at Fantail Falls in Mt Aspiring National Park, Haast Highway near Haast Pass, West Coast, South Island, New Zealand. Schist rocks lay along the banks of the river at Fantail Falls in Mt Aspiring National Park. 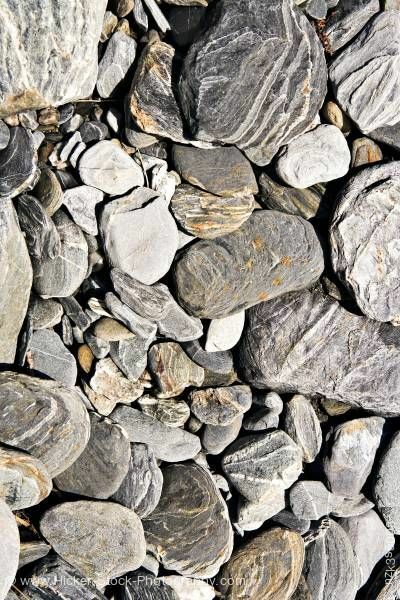 This stock photo shows the gray and white schist rocks on the banks of the river at Fantail Falls in Mt Aspiring National Park, Haast Highway near Haast Pass, West Coast, South Island, New Zealand. In Mt Aspiring National Park, schist rocks lay on the banks of the river. The dry sun drenched rocks vary in size and in color. The rocks are gray but they vary in hue from almost white to a deep gray. White veins run through the rocks. Some of the veins run softly through the rocks, others can be dominated by the white veining. All different shapes and sizes lay along the banks of the river at Fantail Falls. Some of the rocks have spots of a golden tan on them. Schist rocks on the banks of the river at Fantail Falls in Mt Aspiring National Park, Haast Highway near Haast Pass, West Coast, South Island, New Zealand.